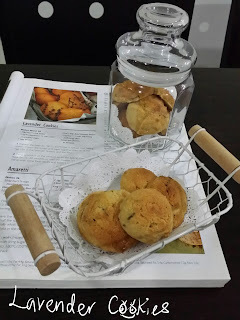 I suddenly had craving for some home-baked cookies recently .... hee .. hee ... 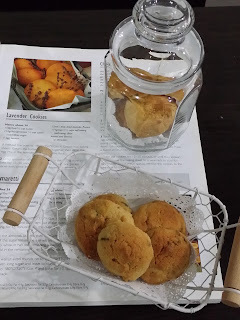 Saw this recipe in the cookbook which I've bookmarked sometime ago ... besides .. 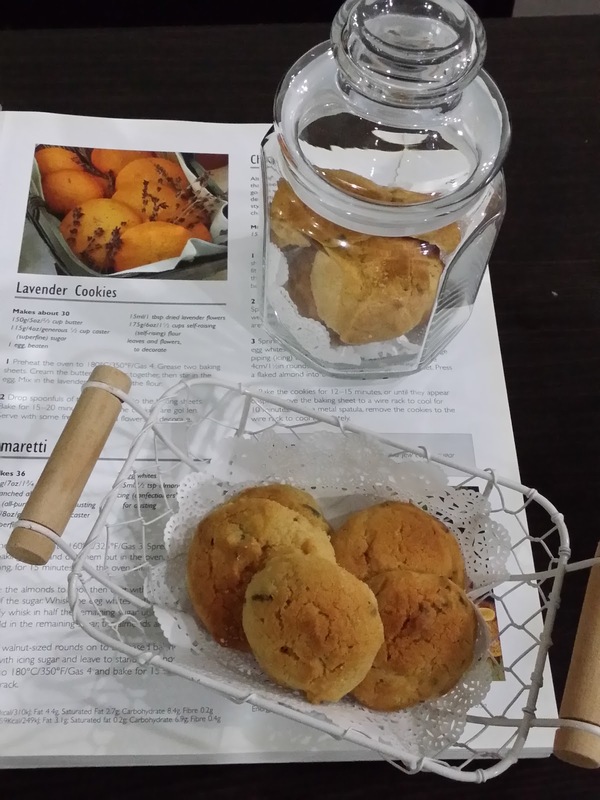 I've got lots of dried lavender flowers to try out in baking ! Easy to bake these yummy fragrant lavender cookies with just few steps to follow. They are best pair-off with a cup of hot beverage but I like it with a glass of cold chocolate milk ... yes, in such warm and humid weather lately. Recipe adapted from the cookbook "Cakes and Bakes 500" by Martha Day, below my slight modification and notes made in blue. 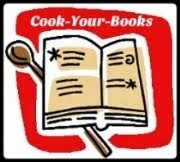 Preheat the oven to 180ºC, position the rack in the center. The temperature of the oven may vary, do adjust accordingly. Cream the butter and sugar together with electric mixer. Stir in the egg. Next, mix in the dried lavender flowers and the flour. Drop spoonful of mixture on the baking sheets. Bake for 15 - 20 minutes or until the cookies are golden. Remove the cookies from the baking sheet and cool on a wire rack before storing them in airtight container. If you wish, serve with some fresh leaves and flowers to decorate. You're welcome, Linda. And thanks for dropping by my post. 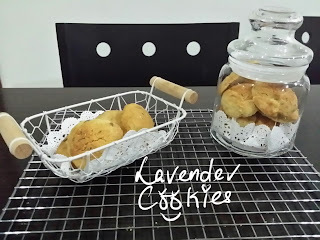 Even though I haven't tasted any lavender cookies before, yours look good! These lovely lavender cookies would be nice to go with tea. 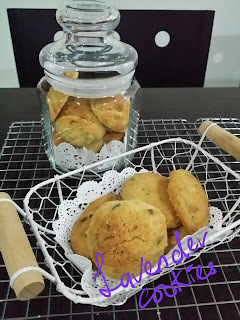 Hi Karen, I love cookies like this, such a great idea, I have made rosemary cookies before but nothing like this, so clever. Hi Karen, I supposed you can't get this kinda of cookies easily at the stores. Good decision to make some at home. Would like to this some time. These cookies already sound so fragrant from its name! Must be really nice with a cup of warm tea! And cold chocolate milk sounds good!